Steps to Download and Install official Android Marshmallow On Galaxy J7 SM-J700M: Samsung starts rolling out the latest Android Marshmallow for Samsung Galaxy J7 SM-J700M.The Official Android Marshmallow Update for Samsung Galaxy J7 SM-J700M is now available for download. The update is an Official Marshmallow which rolls out in phase wise manner.You can manually check whether the update is available in your region or not.To check Go to Settings > About Phone Section > Software Update.Many users reported that they still not received the OTA update, so we are providing the Marshmallow OTA file for Galaxy J7 SM-J700M with that you can Update Samsung Galaxy J7 to Marshmallow Manually. The update is now available in now available via OTA (Over-The-Air) and many users are already getting Android 6.0 marshmallow update for Samsung Galaxy J7 SM-J700M. If you can’t wait for OTA, you can Update Samsung Galaxy J7 SM-J700M to Marshmallow manually. 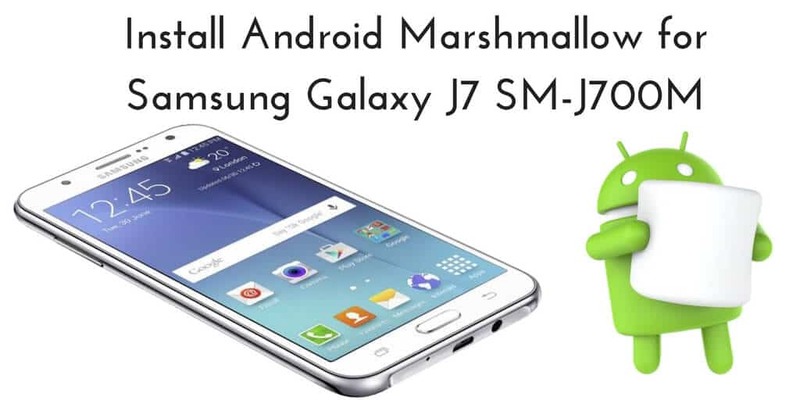 Below we are going to share a detailed guide to Install official Android Marshmallow On Galaxy J7 SM-J700M which will help you to Update your Samsung Galaxy J7J700M to Marshmallow Manually. The update is rolling out via OTA (Over-The-Air) and many users already getting Android 6.0 marshmallow update for Samsung Galaxy J7 SM-J700M. If you can’t wait for the official OTA, you can Update Samsung Galaxy J7 SM-J700M to Marshmallow manually. The OTA file provided below is only for Galaxy J7 SM-J700M, so don’t try it on other devices. Marshmallow update for other ‘J’ series will be available soon. Check below steps to Update Samsung Galaxy J7 SM-J700M to Marshmallow Manually. Enable USB debugging on your Galaxy J7 smartphone. Download Galaxy J7 Android 6.0 Firmware.